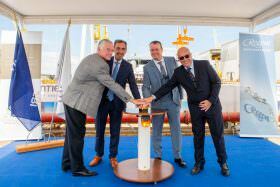 With a ceremonial good luck champagne bottle shattered against the freshly-painted Seven Seas Splendor hull, the new Regent Seven Seas’ ship celebrated a construction milestone on Feb. 9 as she floated from the building dry dock to touch the sea for the first time. 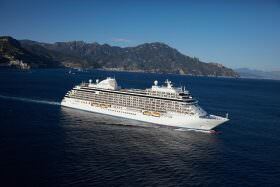 Regent Seven Seas Cruises announced an order with Italy’s Fincantieri S.p.A. to build another explorer-class cruise ship. With delivery scheduled in late 2023, the new vessel will be a sister ship to the Seven Seas Explorer and Seven Seas Splendor. Regent Seven Seas Cruises revealed its 2020-2021 itineraries, which showcase 167 sailings including maiden calls to 11 new ports. 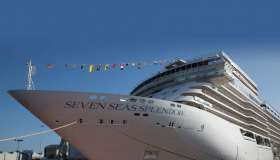 Seven Seas Splendor will voyage across Europe during her inaugural 15 summer sailings after joining Regent’s fleet in February 2020. Reservations open for Seven Seas Splendor’s 2020 inaugural European summer itineraries on July 12, 2018.